Part 1: What is Insulin Resistance? The hormone insulin plays a number of roles, one of which is to help move the glucose that is produced from the digestion of food – from the blood and into the cells for energy. 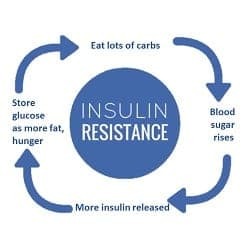 Insulin resistance is where the body isn’t responding to insulin’s signals to take up glucose, so blood glucose remains high, despite normal or high levels of insulin. Type 2 Diabetes (T2D) is essentially a state of very high insulin resistance. Insulin normally goes up when we eat foods that contain carbohydrate (breads, pasta, rice, fruit, milk products, etc.) and acts on the liver to help store the incoming food energy – first as glycogen and when liver and muscle glycogen stores are “full”, it acts to store the excess energy as fat (de novo lipogenesis). When we haven’t eaten for a while or are sleeping, the hormone glucagon acts to break down the glycogen in our muscles and liver (glycogenolysis) in order to supply our brain and cells with glucose. Insulin acts to inhibit glucagon’s action, which signals the body to stop making new glucose from its glycogen stores. When our glycogen stores run out (such as when we are fasting), the body turns to non-carbohydrate sources such as fat to make the glucose it needs for essential functions (gluconeogenesis). When we are insulin resistant, insulin continues to act on the liver to signal it to store energy. When glycogen stores are “full”, it stores the excess energy as fat. When fat stores are “full”, the body starts storing the excess fat that the liver keeps making, inside the liver itself. There shouldn’t be fat in the liver, but when we are insulin resistant, such as in Type 2 Diabetes excess fat gets stored in the liver in a condition known as “fatty liver disease”. In insulin resistance, the liver becomes more sensitive to insulin’s signal to make fat (and as a result keeps making more and more fat) yet at the same time, the liver becomes less sensitive to insulin’s inhibition of glucagon – resulting in more and more glucose being produced and released in the blood. High levels of glucose remain in the blood despite adequate insulin, and it is this high level of blood glucose that is the hallmark symptom of Type 2 Diabetes. For the same quantity of insulin released, the body moves less and less glucose into the cell. What does the body do to compensate? It makes more insulin! KEY POINT: Insulin resistance results in the increased production of insulin. Increasing blood sugar CAN a symptom, caused by the insulin resistance, but blood glucose can be normal and one can still be insulin resistant (see Featured Article on Insulin Resistance). When we are insulin resistant and keep eating a carb-based diet, the body requires more and more insulin in order to move the same amount of glucose into the cell. The main issue then becomes too much insulin (hyperinsulinemia). In Type 2 Diabetes (which is in essence, very high insulin resistance), the symptom is high levels of glucose in the blood. That is not the cause. It is the symptom. High levels of glucose in the blood resulting from uncontrolled Type 2 Diabetes, results in proteins in the body becoming “glycosylated”. Glucose, is a highly reactive molecule and easily accepts (or “shares”) electrons from other molecules – especially from the amino acid Lysine, which is found in virtually every protein in the body. When Lysine and glucose share an electron, it creates an irreversible chemical bond between the glucose molecule and the protein – and that protein is said to have become glycosylated. It is this glycosylation that lies behind the complications found in Diabetes. To reduce the glucose in the blood and the glycosylation of the body’s proteins, current treatment for Type 2 Diabetes involves medications that move glucose from the blood into the cells. This doesn’t really remove the excess glucose from the body, it simply moves it to a different location in the body. While these medications can be very helpful in the short term (until people begin to address the underlying dietary causes), over time these medications become less and less effective at removing glucose from the blood. In a sense, we become “medication resistant”, so additional medications are added. Once the various combinations of medications loose their effectiveness, people with Type 2 Diabetes are prescribed insulin as a treatment – because insulin moves excess glucose into the cells. But the cells are already overflowing with too much glucose! Insulin is added as a treatment when the body is already producing too much insulin. The problem is the cells aren’t responding to the signal from insulin. The body doesn’t need more insulin – it needs the cells that are sensitive to respond to insulin’s signal. Type 2 Diabetes is described as a “chronic, progressive disease” because with current medication treatment, people eventually get worse. When they no longer respond to the initial medications prescribed that help move excess glucose from the blood into the cells, they are prescribed insulin which they take by injection – in order to force more glucose into already over-full cells. While people’s blood glucose gets better (i.e. the symptom improves), they gain weight as a result of the insulin injections and develop complications such as heart disease, stroke, kidney disease, blindness etc.. In the end, they don’t get better, but worse, fulfilling the belief that T2D is a chronic, progressive disease. Rather than looking at the symptom (high blood glucose) as something that needs to be “fixed” with medications and later with insulin (when the medications are no longer effective), when we define insulin resistance and Type 2 Diabetes as a problem of excess insulin, we approach addressing the problem differently. By changing what we eat, we can lower the amount of glucose in the body, which in turn causes the body to produce less insulin. With less insulin being produced, the cells begin to respond to normal amounts of insulin – reversing insulin resistance and yes, reversing the symptoms of Type 2 Diabetes. Eating a low carb high fat diet and extending the amount of time between meals (intermittent fasting) lowers the production of insulin, resulting in the cells become more sensitive to its signal. Rather than addressing the symptom (which is high blood glucose) we are addressing the problem of too much insulin. Have questions? Would like to know how I could help you? Why not send me a note using the “Contact Us” form on the tab above. In Part 2, I will explain how insulin resistance is measured and how we can track insulin sensitivity returning, as we continue to eat a low carb diet and increase the time between meals. Next PostNext Part 2: How is Insulin Resistance Measured?